Enjoy our terrific opportunity to visit the hypnotic attractions in Luxor in addition to a superb tour in Abu Simbel Temples while being in Cairo. 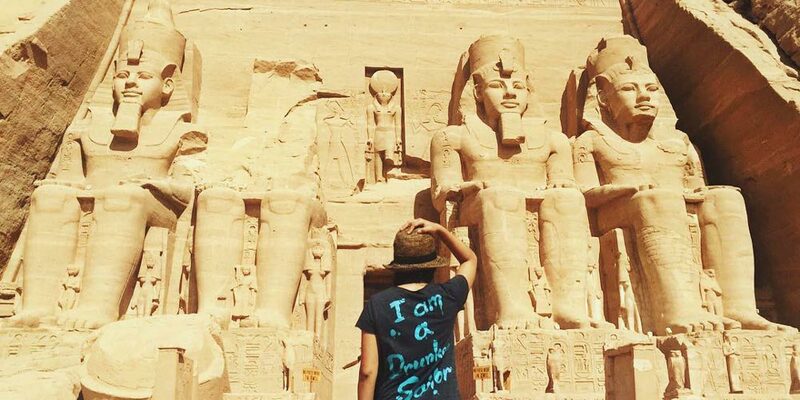 During your 2 days tours from Cairo to Luxor and Abu Simbel, you will witness the beauty of the two temples of Abu Simbel and you’ll also head to the tiptop attractions in Luxor including Hatshepsut Temple, Colossi of Memnon, Valley of the Kings, and the spectacular Karnak Temple. Tour Location: Luxor - Abu Simbel. 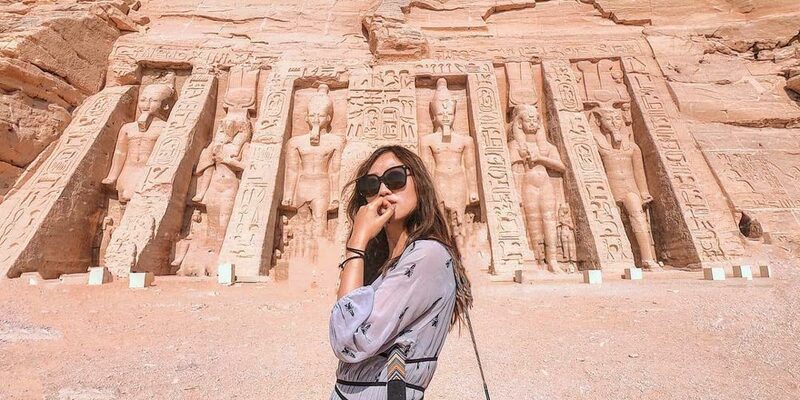 Today is a great day for absolute happiness while enjoying the majesty of the Ancient Egyptian Pharaohs through magical 2 days tours from Cairo to Luxor and Abu Simbel. Our representative will pick you up from your hotel in Cairo so that you catch your flight from Cairo airport and head to Aswan airport where you’ll be transferred with the help of a professional tour guide in an air-conditioned vehicle to visit: Abu Simbel Temples which represent the real love between kings and queens. The Great Temple in Abu Simbel is dedicated to Ramses II who is known with his victory in Kadesh Battle. He loved his wife Nefertari so much that he built a special temple for her in Abu Simbel which was dedicated to her and Hathor. All tourists come to witness Abu Simbel Sun Festival, which represents the creativity and uniqueness of the Ancients. You will have your delicious lunch meal and then head with your private A.C. vehicle to your 5* hotel in Aswan for overnight. After having your breakfast at your hotel in Aswan, you’ll check out your hotel to be transported in an A.C Vehicle to catch your first class train to Luxor in order to continue the rest of your gorgeous trip in Egypt. 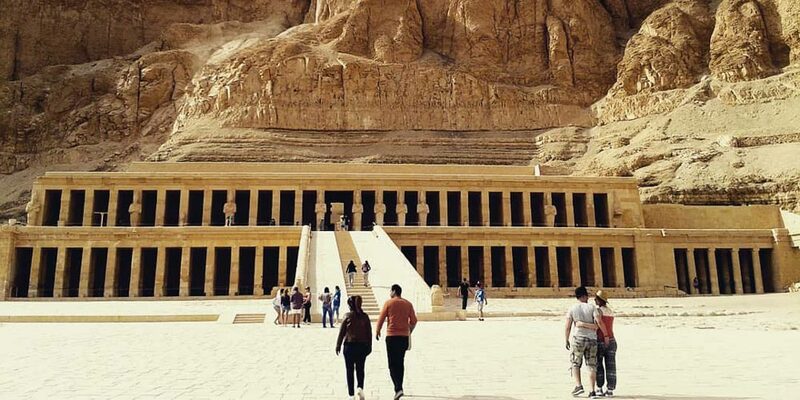 Upon your arrival, your tour guide will help you to visit the amazing landmarks in Luxor starting from: Valley of the Kings, the last resting place of the Ancient Pharaohs and there you’ll visit the amazing tombs inside the Valley including the tomb of Pharaoh Tutankhamun. Then, you’ll visit the gorgeous Temple of Hatshepsut, where you’ll see the terrific decorations inside. 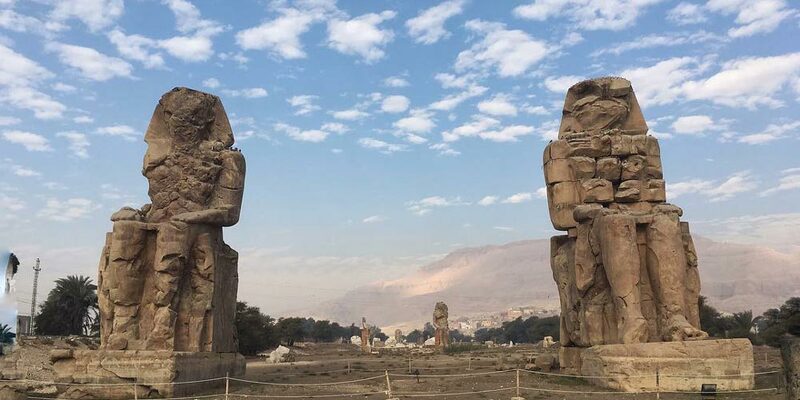 After that, you’ll head to visit the wonderful Colossi of Memnon, which are the two amazing statues of Amenhotep III that were built to protect his temple and they stood against many natural disasters. 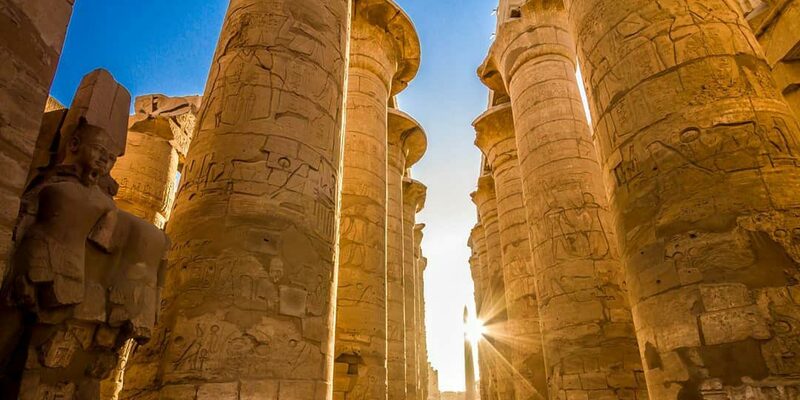 Your lunch will be served at an amazing restaurant with a Nile View and after finishing it you’ll join your expert tour guide to visit Karnak Temples, which is considered the largest temple that has ever been built and it actually consists of three temples. Finally, you’ll be transferred to Luxor airport to catch your flight back to Cairo, where you’ll find our representative waiting for you to assist you in finishing all of the formalities so that you get a ride in an A.C. vehicle to get back to your hotel in Cairo. Travel to live through our irresistible 2 days tours from Cairo to Luxor and Abu Simbel.